Less than 100 years after all adult women in the UK were finally granted the vote, a film about the struggle to gain that basic democratic right emerges. With a dream team of female talent in front of and behind the camera, Sarah Gavron's Suffragette is a gripping start, but it becomes clear that there is far more of this true story of tremendous sacrifice left to be told. 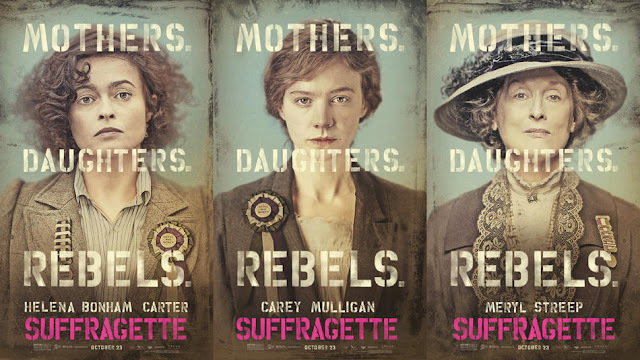 Suffragette makes the interesting decision to follow fictional character Maud Watts (Carey Mulligan) from washer woman and poverty-stricken working mother to militant suffragette engaged in escalating actions against the government. To the detriment of her own family life, she joins Edith Ellyn’s (Helena Bonham Carter) group of East London women who are spurred on by the currently in-hiding Emmeline Pankhurst (Meryl Streep). As Inspector Steed (Brendon Gleeson) keeps a close eye on the women, their civil disobedience becomes more volatile and threatens to land them all in prison. To a young audience raised in a world increasingly full of strong women who may never have even questioned their right to vote, the suffragette's struggle looks at once completely ludicrous, and at the same time teeth-grindingly infuriating. How dare men decide that women didn't deserve the vote? It’s an unimaginable situation that seems preposterous, but is still sadly relevant. The closing crawl of the film indicates the year that women got the vote in other countries of the world, and unbelievably the UK was far from the most recent. Suffragette sits neatly alongside 12 Years a Slave as a document of the Western world's recent history where depressing barbarity was carried out in the name of old white men who were desperate to never let any power slip from their hands. The working class washer women in Suffragette are little more than slaves, being paid far less and working longer hours than their male counterparts. Those that speak out against the unfairness of the system are beaten, threatened, humiliated, ridiculed and made to feel ashamed. And this is where the true tragedy of Suffragette lies. Because while it covers the famous incident involving Emily Davison's brave sacrifice involving the King's horse, it's really the story of ordinary women engaged in everyday action. Even Streep's Pankhurst only appears for a single scene, though her inspiration and influence is felt throughout. Maud sacrifices so much for the cause, including her beloved son and her job, and it is this tension between doing what she wants (to see her son) and what she must do (make the world a better place for future generations of women) that is so heart-wrenching. Suffragette feels just as relevant today as it would have been in 1912. Women are abused, belittled and laughed at by men. But they also face the impossibly difficult choice of often wanting to manage a family with a desire to do something potentially more fulfilling outside of the home. It's a choice which Suffragette pointedly shows a single father tragically failing to consider. It also deals with the notion of what is basically terrorist action, as the women have become fed up with not being listened to, and decide on a policy of non-violent but destructive disobedience. In its mentions of police surveillance and brutality, and the media's tendency to ridicule those who threaten the status quo, Suffragette constantly reminds of none-more-contemporary issues. For a period drama, Suffragette feels righteous and urgent in its fury. The performances are uniformly excellent, particularly Mulligan and Anne-Marie Duff, while Gavron's direction is best when highlighting the horrors of hard labour in the laundry and more so, the barbarity of the women's treatment during prison stints. It’s a shame not to learn more about Emily Davison as she plays such a fundamental role in the climax, but Suffragette's focus on the fictional Maud makes for an incredibly emotive journey.